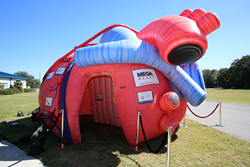 Guests are invited to walk through the world’s only portable, inflatable human heart -- which is bigger than a delivery truck -- when Florida Hospital brings the MEGA Heart to MOSI on March 9, 2016. We know that education and prevention are key components in the fight to save lives from heart disease. Florida Hospital and MOSI present the “MEGA Heart” exhibit for guests and 100 Sligh Middle School students to step inside on Wednesday, March 9, from 10 a.m. to 1 p.m. at MOSI. The MEGA Heart is the world’s only portable, inflatable, walk-through heart exhibit. At 26 feet long and 13 feet high, it’s bigger than a typical delivery truck. During the event, Florida Hospital Cardiologist Dr. Nadim Khan will give an inspiring talk to students from the Medical Studies and Explorations magnet program at Sligh Middle School. 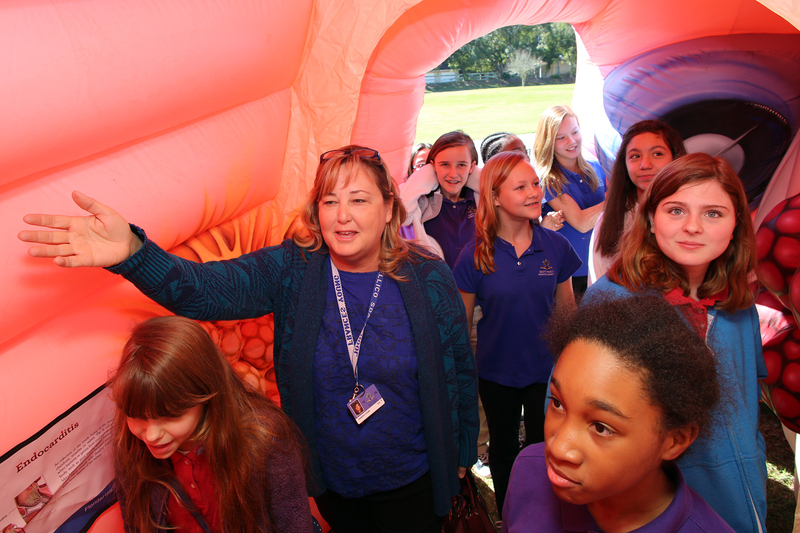 The 6th, 7th, and 8th graders will get a hands-on learning experience inside the inflatable human heart and participate in guided tours with Florida Hospital medical professionals. This special MEGA Heart event is open to all guests and included with MOSI admission. The MEGA Heart experience is the latest event in a partnership between Florida Hospital and MOSI. This event finalizes a month-long Heart Lecture Series, where Florida Hospital hosted seminars at MOSI featuring cardiovascular experts educating the community on general heart health, new procedures, and clinical trials that are available right here in Tampa Bay. “We know that education and prevention are key components in the fight to save lives from heart disease. We hope people become better-educated while having fun learning about the heart. This giant ‘MEGA Heart’ will be a great hands-on learning experience for all ages, students and adults,” said Dr. Nadim Khan, Florida Hospital Cardiologist. Florida Hospital wholeheartedly supports MOSI’s core ideology: to make a difference in people’s lives by making science real for people of all ages and backgrounds… helping to nurture the future scientists and health professionals. The partnership is focused on creating additional programs, enhancing existing science education, and advancing public interest of science, industry, and technology. Florida Hospital believes this relationship will provide life-changing experiences for families and support young men and women considering careers in the field of medicine. In 1982, MOSI opened to the community and is now the largest science center in the Southeast and the 8th-largest in the nation. It’s the only institution with the focus of experiential STEAM education (Science, Technology, Engineering, Arts, and Math) in the Tampa Bay region. 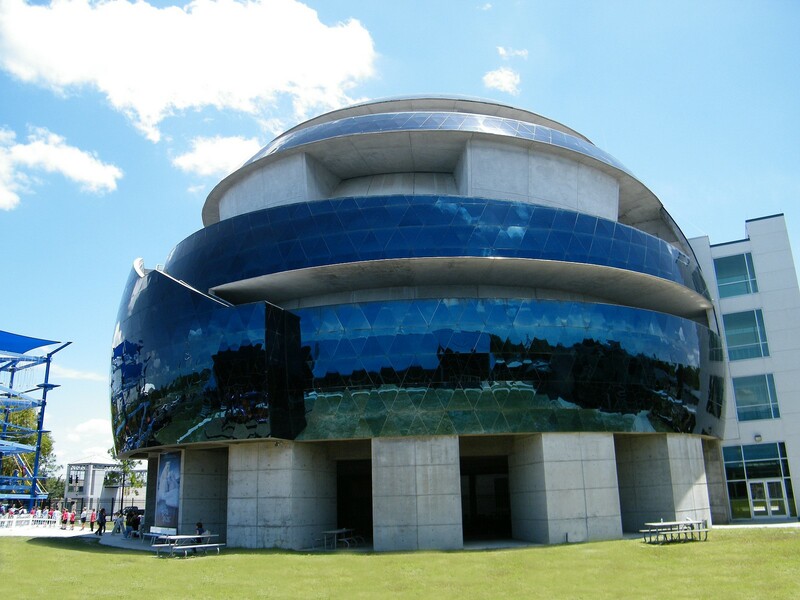 MOSI is a not-for-profit, community-based institution and educational resource dedicated to advancing public interest, knowledge, and understanding of science, technology, engineering, art, and math (STEAM) and is home to the Florida Hospital IMAX® DOME Theatre, the only IMAX® DOME experience in the state of Florida. MOSI's core ideology is to make a difference in people's lives by making science real for people of all ages and backgrounds. MOSI gives away more than $3 million in free memberships each year, $250,000 in free tickets annually, and approximately 400 scholarships each year for children to attend MOSI Summer Science Camps. Additionally, MOSI’s education staff works closely with area teachers offering free training and support for area science educators. 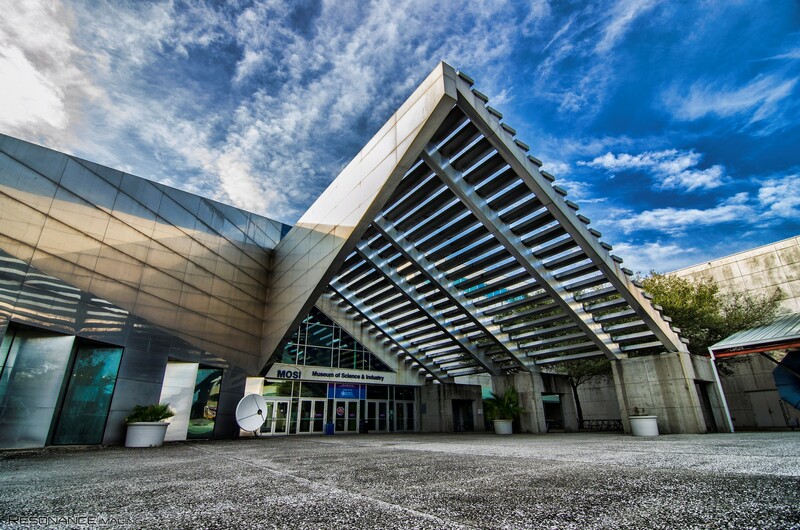 With a total size of more than 400,000 square feet, MOSI is the largest science center in the southeastern United States. Learn through play inside Kids In Charge! the largest Children’s Science Center in the nation or The Amazing You—a 13,000-square-foot exhibition on health and wellness. 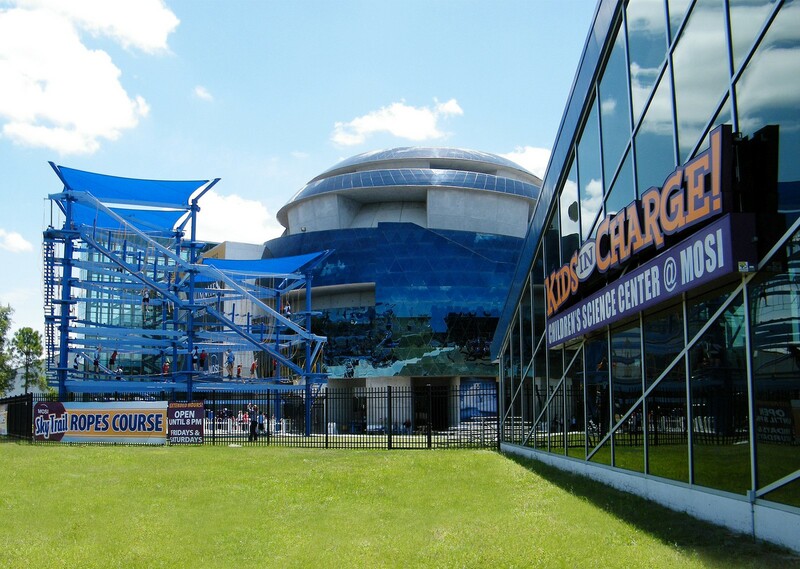 Conquer your fears on MOSI’s Sky Trail® Ropes Course and Zip Line. Budding inventors can engineer anything imaginable and hold it in the palm of their hand in MOSI’s technology playground and inventor’s studio, Idea Zone; and aspiring astronauts can travel to the moon to operate a lunar colony in Mission: Moonbase, funded in part by NASA. MOSI is the proud winner of the 2009 National Medal for Museums by the Institute of Museum and Library Services, the nation’s highest honor for museums. For more information on MOSI, visit mosi.org. The Florida Hospital West Florida Region is a not- for- profit 1,275-bed hospital system composed of Florida Hospital Tampa/Pepin Heart Institute, Florida Hospital Carrollwood, Florida Hospital at Connerton Long Term Acute Care, Florida Hospital North Pinellas, Florida Hospital Wesley Chapel, Florida Hospital Zephyrhills, Florida Hospital Heartland Medical Center Sebring, Florida Hospital Heartland Medical Center Lake Placid and Florida Hospital Wauchula. Part of the Adventist Health System, Florida Hospital is a leading health network comprised of 22 hospitals throughout the state. For more information, visit FloridaHospital.com.